Every first Monday in May, the Metropolitan Museum of Art hosts the Met Gala. Informally deemed “the Oscars of the East Coast,” it is fashions’ biggest night with the most prominent names in entertainment, fashion, sports and business dressed in trend-setting, glamorous outfits. This year’s theme “Heavenly Bodies: Fashion and the Catholic Imagination” will undoubtedly stimulate plenty of conversation in the fashion and pop culture world. Shutterstock will be on the red carpet at the Met covering all the biggest stars and hottest fashions of the night. Follow us on Twitter and Instagram for real time coverage of the most memorable photos from the night. Beyond our coverage of the upcoming event, Shutterstock also has extensive Met Gala archival content, dating all the way back to the 1970s. The collection captures decades of fashion history and includes shots of a youthful Ralph Lauren, Carolina Herrera, Marc Jacobs, and more. See a selection of photos below, and to learn more about our Editorial collection you can view more of images across news, sports and entertainment on Shutterstock Editorial. To inquire about licensing opportunities, please email editorialsales@shutterstock.com. Pop star Rihanna on the red carpet at the 2017 Met Gala, Rei Kawakubo/Comme des Garçons. Supermodel Bella Hadid posing for photographs at the 2017 Met Gala, Rei Kawakubo/Comme des Garçons. Pop star Katy Perry on the red carpet at the 2017 Met Gala, Rei Kawakubo/Comme des Garçons. Pop star Rihanna on the red carpet at the 2015 Gala, China: Through the Looking Glass. Pop superstar Beyoncé with sister Solange Knowles at the 2016 Gala, Manus x Machina: Fashion in an Age of Technology. Pop superstar Justin Bieber at 2015 Gala, China: Through the Looking Glass. Actress-model Cara Delevingne on the red carpet at the 2015 Gala, China: Through the Looking Glass. Pop star Katy Perry, designer Jeremy Scott, and superstar Madonna at the 2015 Gala, China: Through the Looking Glass. Rapper Kanye West and Kim Kardashian West at the 2015 Gala, China: Through the Looking Glass. Pop star Lady Gaga at the 2016 Gala, Manus x Machina: Fashion in an Age of Technology. Model Karolina Kurkova and pop star Psy at the 2013 Gala, Punk: Chaos to Couture. Supermodels Gigi and Bella Hadid with actress-comedian Amy Schumer at the 2016 Gala, Manus x Machina: Fashion in an Age of Technology. Actress Emmy Rossum at the 2014 Gala, Charles James: Beyond Fashion. Pop star Ciara at the 2016 Gala, Manus x Machina: Fashion in an Age of Technology. Willow and Jaden Smith at the 2016 Gala, Manus x Machina: Fashion in an Age of Technology. Vogue editor Anna Wintour, actress Jennifer Lawrence, Yahoo CEO Marissa Mayer, Gong Li, and Wendi Murdoch at the 2015 Gala, China: Through the Looking Glass. Supermodel Naomi Campbell at the 2014 Gala, Charles James: Beyond Fashion. Gwen Stefani and Jennifer Lopez at the 2013 Gala, Punk: Chaos to Couture. Actor Tom Cruise and actress Katie Holmes at the 2008 Gala, Superheroes: Fashion and Fantasy. Pop star Madonna, Donatella Versace, and superstar Cher at the 1997 Gala, Gianni Versace. Italian designers Stefano Dolce and Domenico Gabbana with supermodels Naomi Campbell and Iman at the 2001 Gala, Jacqueline Kennedy: The White House Years. Designers Donna Karan, Marina Schiano, and Marc Jacobs at the 1990 Gala, Théâtre de la Mode – Fashion Dolls: The Survival of Haute Couture. Designer Diane von Furstenberg at the 1983 Gala, Yves Saint Laurent: 25 Years of Design. Actress-model Brooke Shields and her mother Teri Shields at the 1983 Gala, Yves Saint Laurent: 25 Years of Design. Barbara Allen, Andy Warhol, and friends at the 1977 Gala, Vanity Fair: A Treasure Trove. 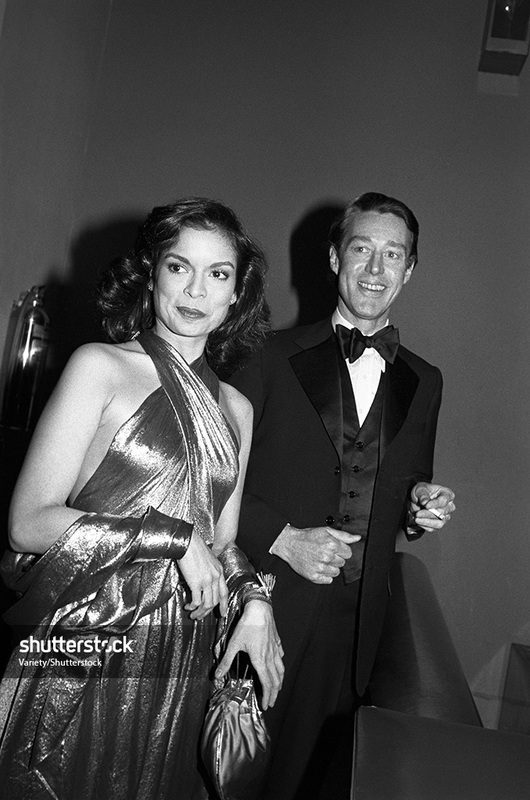 Bianca Jagger and Roy Halston at the 1977 Gala, Vanity Fair: A Treasure Trove.